Remove fat from beef. Cut beef into 1-inch pieces. Mix remaining ingredients in medium glass or plastic bowl. Stir in beef until coated. Cover and refrigerate, stirring occasionally, at least 1 hour but no longer than 12 hours. Set oven control to broil. Remove beef from marinade; reserve marinade. Thread beef on each of four 10-inch metal skewers, leaving 1/2-inch space between each piece. 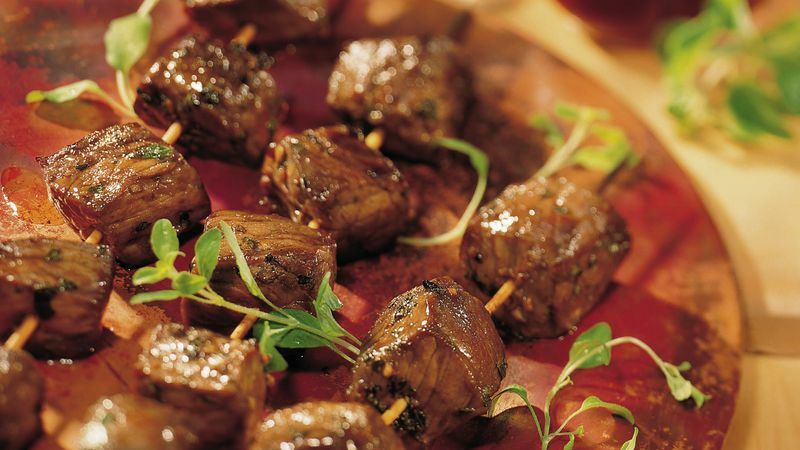 Brush kabobs with marinade. Place kabobs on rack in broiler pan. Broil kabobs with tops about 3 inches from heat 6 to 8 minutes for medium-rare to medium doneness, turning and brushing with marinade after 3 minutes. Discard any remaining marinade. Although you might be tempted to serve the extra marinade with the cooked kabobs, you should discard any marinade that has been in contact with raw meat. Bacteria from the raw meat could transfer to the marinade. To speed up prep, omit the garlic, vinegar, water, oregano, oil, marjoram and sugar, and instead, marinate the beef in 2/3 cup purchased Italian dressing in step 2. If using bamboo skewers, soak in water at least 30 minutes before using to prevent burning.